Mobile bidding is the use of mobile technology to allow guests to bid on items and raise funds for an organization at both silent and live auctions. 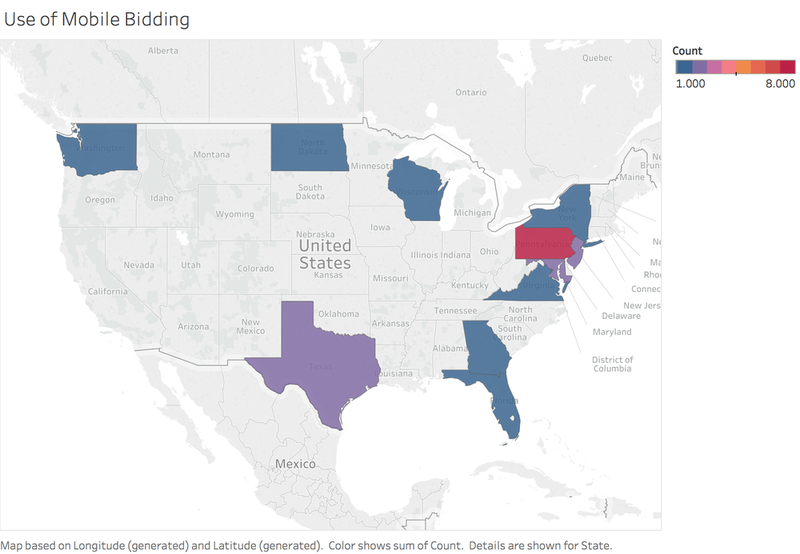 Vendors of mobile bidding platforms include Bidpal, 501 Auctions, BiddingForGood, and Gesture. Nonprofit organizations that activate mobile bidding at their live events may generate 10 to 50 percent more revenue from using mobile bidding. The use of mobile bidding software is a way of transforming the auction into a 24/7 online fundraiser that allows users to raise money before, during, and after a live event. Organizations select a mobile bidding vendor to host their auction. Fundraisers and auction managers procure and enter the selected auction items into the mobile bidding platform and sell tickets to the event online. When guests arrive, event staff or volunteers register them by logging them into mobile devices and entering their payment information. Guests have the option of using their own mobile devices or to borrow one provided by the organization or vendor. During the event guests bid on auction items via the device and receive notifications when they are outbid. The organization can view ad hoc analytic reports during the event to monitor the auction’s progress. At the end of the auction, guests pay for items that they won on the app, and automatically receive email receipts recording their donation. Mobile bidding technology not only makes auction events easier for the organization’s staff, but also for participating donors. In traditional auctions, guests would need spend most of their event experience at the auction to continually participate. With the use of this technology, guests can continue to roam through the event, enjoying other parts of it, while still bidding in the auction. This allows for auction revenue to rise, as guests have more opportunities to outbid the competition for desired items. Make-A-Wish Colorado is one of the country’s oldest chapters of the Make-A-Wish Foundation. The organization “grants the wishes of children with life-threatening medical conditions to enrich the human experience with hope, strength, and joy.” One challenge Make-a-Wish Colorado faced during live auctions was the checkout process. It took significant time and resources to execute. There were also guest experience concerns. For example, during an event where athletes were present it was not easy for guests to balance meeting the athletes and bidding on auction items. Make-a-Wish Colorado worked with Gesture as their mobile bidding vendor. Utilizing mobile bidding technology allowed guests at the Sporting Affair events greater flexibility to enjoy the event because they could bid on items and receive outbid notifications via mobile devices and did not have to miss meeting the athletes. The organization also used electronic email receipts to avoid the resources required for printing. Make-a-Wish Colorado saw a 45% increase in auction revenue when they first implemented mobile bidding at the Sporting Affair event. From 2014 to 2017, the organization raised over $770,700 from over eight campaigns. The Pine School is a private college preparatory school that serves students from kindergarten to 12th grade. The school hosts the “Annual Evening at Auction,” with proceeds benefiting the school’s academic and outreach programs. The challenge was that sponsorships for the event had decreased, and therefore the school needed to increase their auction revenues. The Pine School chose to utilize OneCause’s mobile bidding technology, Bidpal, to support its gala. Bidpal supports auction events in various capacities, from designing a personalized event page on mobile devices to sending email receipts. The technology is able to integrate with online auction platforms to provide increased engagement for participants with easier operations. Although sponsorships had declined, revenues from the silent auctions increased with the utilization of mobile bidding. The Pine School raised $77,000 in total contributions in 2012, more than double compared to the year before. The Pine school also used Bidpal to sell tickets to a special luncheon. The event sold out in less than five minutes, earning the school an additional $3,600. According to the auction coordinator’s comment, the technology simplifies payment collection steps and the process became more efficient in time. The primary purpose of mobile bidding from these examples was to better facilitate live or silent auction events by using technology everyone has, mobile devices. As a result, the team found two key findings. First, mobile bidding generated the largest average gift when the nonprofit used it for the first time. Second, of the cases analyzed, all organizations generated a significant increase in their one-time donation. There are more similarities than differences between arts organizations and their social nonprofit peers in utilizing mobile bidding. Both sectors use mobile bidding to support special events, enhance engagement with their donors, and improve overall donor experience. For example, the Make-A-Wish Colorado case study used mobile bidding for its Sporting Affair to improve its clients’ experience during the auction by speeding up the check-out process. According to survey results, over 85% of arts organizations share same goal. There are organizations in the arts that are either not aware of some emerging digital fundraising technologies like mobile bidding, or do not have funds or staff to support it. According to a CRM system interview, some organizations still use traditional paper-based auctions. This account comports with survey findings stating that 26% of arts organizations report using mobile bidding, the second most popular emerging digital fundraising tool by survey respondents. “Mobile Bidding | Silent & Live Auction Software for Nonprofit Fundraising,” OneCause, March 2, 2018, www.onecause.com/mobile-bidding-auction-software/. “Mobile Bidding for School and Nonprofit Fundraising Auctions,” BiddingForGood, accessed March 2, 2018, https://www.biddingforgood.com/online-auction-services/products/mobile-bidding.html. "Make-A-Wish Colorado- GuideStar Profile,” GuideStar, accessed May 02, 2018, https://www.guidestar.org/profile/74-2273004. "The Sporting Affair," Make-A-Wish® Colorado, accessed April 09, 2018, http://colorado.wish.org/news-and-events/calendar-of-events/events-time-folder/the-sporting-affair-2017. "Make-A-Wish Colorado,” Case Study (Westmont, IL: Gesture, n.d.), 2. “Academics,” The Pine School, accessed May 10, 2018. http://www.thepineschool.org/academics/. Our Mission and Philosophy,” The Pine School, accessed April 09, 2018, http://www.thepineschool.org/about-us/. “Mobile Bidding | Silent & Live Auction Software for Nonprofit Fundraising," OneCause, April 18, 2018, accessed April 21, 2018, https://www.onecause.com/mobile-bidding-auction-software/. "The Pine School: Betting on Higher Revenue," OneCause, March 06, 2015, accessed April 09, 2018, https://www.onecause.com/the-pine-school-betting-on-higher-revenue/. "Evening of Celebration - A Knight In The Movies,” Facebook, accessed April 09, 2018, https://www.facebook.com/events/933355483489740/.